It is with great excitement that 98.9 The Goat will be at Thrifty Foods Cliffe & 17th Location in Courtenay for our Annual Stuff The Truck event December 3rd to December 7th from 8AM to 6PM, and this year we’re extending an exciting Corporate Challenge to help us fill a 4 ton truck for the foodbank! 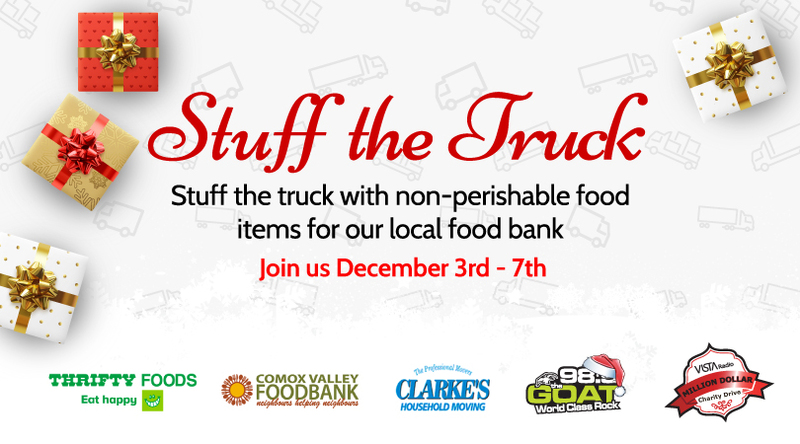 Stuff the Truck is The Goat’s and Vista Radio’s week to give back to the Comox Valley and use the power of radio to raise food and cash donations for our local food bank. With our communities support the shelves will be stocked until early summer! We’re opening up our Corporate Challenge early for anyone that wants to get in on the action ahead of December! Oh, and did we mention we want to tell the Comox Valley that YOU’RE involved? That’s right we’re amping up our airwaves in November with all our early birds who purchase a pallet now with jock talk, name mentions, social media and we’ll add your business name to our website for Stuff The Truck! We also invite you down to Thrifty Foods Cliffe & 17th Location from 8AM to 6PM on December 3rd toDecember 7th to have your picture taken with the pallet for our social media (Facebook & Instagram). Great question! Jeff and his team at Thrifty Foods Cliffe & 17th Location have received a list from the Food Bank that is compiled of their ‘most used’ items. These items can include flour, toilet paper, powdered milk, canned goods, toiletries etc…basic household items that some families struggle to afford. All of these goods are packed onto a pallet, which when fully loaded weighs 1,000lbs! Businesses, local organizations, and private donors are invited to step up to accept our Corporate Challenge and purchase a pallet (or more) at a cost of $500 per pallet. You can even challenge your friends or other businesses! If you wish to donate, please contact us or fill out this form and we’ll contact you.